Sunny to partly cloudy. High near 80F. Winds NW at 10 to 20 mph.. Partly cloudy. Low 52F. Winds WNW at 10 to 20 mph. Lifeguards are on duty as the Dye Natatorium Pool opened its doors for the season April 1. Tehachapi Valley Recreation & Park District offers a variety of pool programs to the public. For more information, visit tvrpd.org. Monthly Community Charitable Quarter Auction, sponsored by the American Legion Auxiliary 221, April 14, doors open at 3 p.m., auction starts at 4 p.m., Veterans Memorial Building, 125 F St. Free with option to purchase "all in paddles," 50/50 and raffle tickets. Snack bar is open. Spring Model Train Show, presented by Tehachapi Loop Railroad Club, Saturday, April 13, 10 a.m. to 5 p.m. and Sunday, April 14, 10 a.m. to 3 p.m., Aspen Builders Activity Center, 410 W. D St. Free admission. Vendors, bake sale and raffle for six-month membership. Kern Audubon Tehachapi quarterly meeting, Tuesday, April 30, 7 p.m., Golden Hills Elementary School. Karen Pestana will give presentation on the Western Bluebird Nest Watch Program. Refreshments and raffle to follow. Call Carol Gates at 300-1429. Rattlesnake Aversion Training for Dogs, May 19, Meadowbrook Park, 21750 Westwood Blvd. Cost is $75 per dog. Call 822-5226 to schedule appointment. Tehachapi Library, 212 S. Green St. Call 822-4938. The following ongoing events will be held: Lego Club for ages 5-11, third Saturdays at 11 a.m.; Preschool Storytime, Fridays at 10 a.m.; Barks & Books, second and fourth Mondays from 4 to 6 p.m., ages K-8th grade, build your reading skills and enhance self-esteem by reading aloud to a furry friend; Tween and Teen Chess Club, Mondays and Fridays from 3 to 5 p.m., ages 8 to 18. Special events: Adult Book club, April 17, "The Deep End of the Sea;" 3D printing classes, April 20, 11 a.m. for kids, 1 p.m. for teens, 3 p.m. for adults, RSVP required; Creative Writing group for teens and adults, April 10 and 24, 5 to 6:30 p.m.; STEAM activity for kids, crazy science experiments, April 27, 2 p.m.; May Day Maypole Celebration, May 1, 5 p.m., festivities celebrating spring with crafts and watching the Maypole Dance, volunteer dancers needed; May the Fourth be With You, Star Wars Extravaganza with fun activities and costume contest for all ages, May 4, 1 to 4 p.m. The Write Stuff writing group, Fridays, 4:30 to 5:30 p.m., Shepherd of the Hills Church, 24300 Bear Valley Road next to Cummings Valley Elementary School. No RSVP and free to the public. Contact tehachapishepherd@yahoo.com or call 822-1400. Tehachapi Mountains Search and Rescue, meets at 8 a.m. the second Saturday of each month, Golden Hills Community Service District Office, 21415 Reeves St. New potential members are always welcome. Tehachapi Municipal Airport Display Day, second Saturday of each month, 9 a.m. to noon, enter by the airport terminal on North Hayes Street. Local pilots will have their hangars open and aircraft on display. Tehachapi Humane Society’s free and low-cost spay and neutering for feral cats and lost/found pet line. Vouchers are free if you drive the cat to Palmdale or California City or $20 for local veterinarian. Tehachapi Humane Society, 823-0699, line 2 for feral cats, line 3 for lost or found pet line. Have a Heart Humane Society offers low-cost spay and neutering clinics with no income qualifications, for dogs ($35) and cats ($25), co-pay includes surgery, rabies shot if needed, microchip and pain injection. Animals under 6 years old are eligible. Cash only at the time of sign-up, no checks or cards for clinic co-pays. Come to Rescued Treasures, 1121 W. Valley Blvd., Suite B. Store hours are Tuesday through Saturday, 10 a.m. to 4 p.m. Call 822-5683. Thunder on the Mountain committee meeting, first Tuesday of every month, 6 to 7:30 p.m., Steampunk Cafe & Grill, 20324 W. Valley Blvd. For more information, email totmcarshow@gmail.com. Tehachapi Amateur Radio Association, second Thursday of every month, 7 p.m., Mountain Aire Estates Clubhouse, 600 S. Dennison Road in Tehachapi. For more information, email ac6ee@arrl.net or call 750-2878. The call-in frequency is on the W6SLZ Repeater, 146.700- (123.00 tone). Outreach Singers, second and fourth Wednesdays, 7 to 8 p.m., Shepherd of the Hills Church. Messaging hope and inspiration to home bound, infirm and senior care facilities. All ages welcome. More information on Facebook @OutreachSingersTehachapi or at OutreachSingers.com. Tehachapi Chapter 2352 of the National Active And Retired Federal Employees, meets on the third Thursday of every month at 8 a.m. at Village Grille, 410 E. Tehachapi Blvd. Call Royal Mink at 821-1015 for more information. Freemasons, Masonic Center, 24309 Cummings Valley Road. Every fourth Wednesday at 7 p.m. Call Royal Mink at 821-1015 for questions. Order of the Eastern Star, part of the Masonic family, meets every third Wednesday of the month. Contact Judith Kennedy, 823-1907, or Vicki Tones 822-4106. Tehachapi Mountain Democratic Club, call 821-0538 or go to www.Tehachapidems.org. Tehachapi Republican Women, Federated, second Monday of each month, September through June, 11:30 a.m. lunch, meeting and guest speaker at noon, Steam Punk Cafe in Old Towne. Lunch cost $16. Open to the public; guests are welcome. Tehachapi Gandy Dancers workshops, Wednesdays, 6:30 p.m., class starts at 7 p.m., Tehachapi Senior Center, 500 E. F St., $7. Tehachapi Collaborative, fourth Thursday of each month, 8 a.m., Tehachapi Police Department conference room. Rotary Club, Thursdays, noon, The Shed. 818-519-7144. Lions Club, first and third Thursday of each month, 6:30 p.m., Tehachapi Senior Center. Tehachapi Valley Arts Association, board meetings, third Monday of each month, 8:30 a.m., Gallery 'N' Gifts, 100 W. Tehachapi Blvd. Tehachapi Valley Gem and Mineral Society, meets fourth Thursday of each month, 7 p.m., Tehachapi Senior Center, 500 E. F St. Visit tvgms.org, or like them on Facebook. Summit Singers rehearsals, Tuesdays, 6:30 to 8:30 p.m., First Baptist Church, 1049 S. Curry St. Call Corinne Stone, 822-3836. Tehachapi Senior Center, 500 E. F St., offers weekly activities and a nutrition program. Call 822-5412. Monday: Yoga, 10:30 a.m.; lunch, noon; Mexican Train (dominoes), noon; line dancing, 1 p.m.
Tuesday: Pinochle/cards, 10 a.m.; Club Stretch, 10:30 a.m.; lunch, noon; wood carving, 1 to 3 p.m.; Grief Support, 1:30 p.m.
Wednesday: Scrabble, 10 a.m.; Yoga, 10:30 a.m.; lunch, noon; Essential Oil & Herb class, 1:30 p.m., first and third Wednesdays. Thursday: Bridge/cards, 9:30 a.m.; Club Stretch, 10:30 a.m.; lunch, noon; Knitting & Crocheting, 1 p.m.; caregivers support, 1 p.m., fourth Thursday; Links 4 Life, 6:30 p.m., second Tuesday. Friday: Respite care, 9 a.m. to 1 p.m., first and third Friday; lunch, noon; poker 12:30 p.m., (except for the third Friday of each month); Friday night fundraiser dinner, 4 to 7 p.m., third Friday. Women of the Moose, 6:30 p.m., second and fourth Wednesdays of the month. Meetings are held at the Veterans Hall, 125 E. F St. For information, call Ginger Nolasco at 238-9312. Tehachapi Mountain Quilters, meetings at 9:30 a.m. on the first Monday of every month at the Shepherd of the Hills Church, 24300 Bear Valley Road. American Legion, 126 E. F St.; Bingo on Fridays, 6 p.m.; meetings on third Wednesdays of each month, 7 p.m.; Auxiliary meetings on first Thursdays. Call 822-5271. BeeKay Theatre, 110 S. Green St. Love the stage? Tehachapi Community Theatre invites you to become a part of the theatrical family. Go to tctonstage.com to see activities, or email kennychugg@tctonstage.com. Big Papa's Steakhouse, 1001 W. Tehachapi Blvd. #200: Line dancing every Wednesday with Gloria Yeager, learn some new dances such as Dirty Work, South Side, Dirt on My Boots, Cruisin, Black Coffee, Riverbank Stomp, Two Step, MM Bop, Chattanooga Lucy and more, 7 to 10 p.m.; Line Dancing and two-step with Bob Burbarella, every first and second Friday starting at 8:30 p.m.; UFC Fights Nights hosted. Call 822-7272. Dog House Saloon, 777 W. Tehachapi Blvd., DJ Wednesday through Saturdays, 8 p.m. to closing; karaoke, Wednesdays, 8 p.m. Call 822-4200. Fiddlers Crossing, 206 E. F St., Wednesdays, Open Mic night, 7 p.m., $6 or $3 for students, children under 12 free. Gandy Dancers: Workshops, every Wednesday, 6:30 p.m., Tehachapi Senior Center, $7. Local Craft Beer, 365 Enterprise Way, Suite G, Open Mic Night, Sundays, 5 to 9 p.m. Call 822-2337. Mountain Music, 206 E. F St.: Ongoing intermediate class with Deborah Hand-Cutler, Wednesdays, 3:30 to 4:30 p.m., $10 per session. Call 823-9994. Savannah’s Old Town Saloon, 20717 South St., DJ Lilia, Wednesdays and Thursdays, 8 p.m. to closing; karaoke, Thursdays, 8 p.m., Friday and Saturdays, music. Call 823-1550. Tehachapi Wine & Cattle Co., 26877 Cummings Valley Road. Wine Down Fridays from 5:30 to 7:30 p.m. with dinner by SteamPunk Cafe and live music, check the Facebook page for menu and musical guests. Reservations required by 1:30 p.m. Friday. Call 822-9233. Tehachapi Depot Railroad Museum, 101 W. Tehachapi Blvd., open Thursday through Monday, 11 a.m. to 4 p.m. Call 823-1100. Tehachapi Museum and Errea House Museum, 310 S. Green St., Friday through Sunday, noon to 4 p.m. Call 822-8152. Tehachapi Scrabble Club, Sundays, 2 p.m., Local Craft Beers, 365 Enterprise Way G. Win a free beer if you form the word "BREWERY" during the game. Games follow Scrabble Association Rules, so please acquaint yourself. Call 858-4318. Tehachapi Treasure Trove, 116 E. Tehachapi Blvd. Call 822-6794. Ongoing classes include: Open studio sessions, Fridays, 10 a.m. to 1 p.m., $5 per session; Playing with Paint with Lucinda Thomas, Sundays, noon to 3 p.m., $15, bring your own paints and boards or purchase them; Adventures in Painting with Juanita Niemeyer, Wednesdays, 10 a.m. to 2 p.m., $20, bring your own project and lunch; After School Kid's Art with Judith Campanaro, ages 6 through 12, Mondays, 3:30 to 5 p.m., $40 a month or $15 a session plus supplies; Travel Journaling with Judith Campanaro, every Tuesday during March, $80 for four sessions. Special classes include: Mixed Media Greeting Cards with Judith Campanaro, April 15, 11 a.m. to 2 p.m., $20; Jewelry Making with Dawn Callahan, 1 to 4 p.m., $25 plus materials, monthly classes held on the third Saturday; Writing Great Fiction with Lauraine Snelling, April 27, 9:30 a.m. to 3:30 p.m., $50 includes workbook. Triassic Vineyards, 24627 Cummings Valley Road: Wine & Dine Fridays, 5 to 7 p.m. Food, live music and award-winning wine. $15 for dinner. For reservations, sendrsvp.com/wineanddine or call 822-5341 ext. 1. Veritas Tapas & Wine Bar, 695 Tucker Road. 822-8220. VFW Post #5948, 221 W. Tehachapi Blvd., karaoke with Erik, first and third Fridays, 7 to 11 p.m. and second and fourth Friday with Tom; pool tournaments, 8-ball on Tuesdays, 9-ball on Thursdays, 7:30 to 10:30 p.m. Call 822-7500. Wellness Group, practice mind-body skills to decrease anxiety in a supportive group, Tuesdays starting April 16 through May 28, 3:30 to 5 p.m., Tehachapi Community Church, 100 E. E St. Space is limited, call Rev. Nancy Bacon at 900-5536 by April 14 to reserve your spot. A weekly donation of $10 is suggested. Divorce Care support group, Tuesdays through May 14, 6:30 p.m., Country Oaks Baptist Church, 20915 Schout Road, Room 402. Join in at any time, at any stage of separation or divorce. Call 822-1379. Grief Share support group, Tuesdays through May 7, 6 to 8 p.m., Country Oaks Baptist Church, 20915 Schout Road. Grief Share is a confidential, non-denominational, Christian based ministry to aid in dealing with grief associated with the loss of family and loved ones. Call 822-1379. Dancercise, 4 p.m. Saturdays, Shepherd of the Hills, 24300 Bear Valley Road. Call 822-1400. Tehachapi Parkinson's Support Group, those with Parkinson's and/or their caregivers are welcome. Meetings are held every second Thursday of the month at 7 p.m. Contact Rob at rwerwarner@gmail.com for location. T.M.G. Alcoholics Anonymous/Al-Anon meetings, held in Tehachapi seven days a week at 20717 South St. For meeting times, call 322-4025. Good Grief Group, Thursdays (ongoing) from 6:30 to 7:30 p.m., Shepherd of the Hills, 24300 Bear Valley Road. This is a confidential, non-denominational, Christian-based support group. Call 822-1400 with questions. Parkinson's Disease Support Group (Movers and Shakers), 6 p.m. Tuesdays, Shepherd of the Hills Church, 24300 Bear Valley Road. Respite for Caregivers, meets Thursdays, 1 to 3 p.m., Tehachapi Senior Center, 500 E. F St. For reservations, call 821-1626. VFW Post #12114, 125 E. F St., counseling, first Wednesdays of each month, 9 a.m. to 2 p.m.
Caregivers Education, fourth Thursday of each month, 1 p.m., Tehachapi Senior Center, 500 E. F St. Chris Barrett helps caregivers through support and information. Call 821-1626. Links 4 Life Breast Cancer Support, second Thursday of each month, 6:30 p.m., Tehachapi Senior Center, 500 E. F St. Call Mary Von Blake at 805-0098. TOPS (Taking Off Pounds Sensibly), Thursdays, 1 to 2 p.m., fellowship hall of Shepherd of the Hills Church, 24300 Bear Valley Road. Cost is $32 per year. Call 822-1400 or write to tehachapishepherd@yahoo.com for details. Stallion Springs Church Easter Sunday services, April 21, 10 a.m., 28400 Stallion Springs Drive. Call 823-0799. Tehachapi Mountain Vineyard activities, 502 W. Pinon, High School Youth Groups, Wednesdays, 6:30 p.m., and Sundays, 11 a.m.; Monday Night Manna and free meal, second and last Mondays of each month, 6 p.m. Call 822-9313, email Saundra Galloway at sgalloway@desertvineyard.com or visit tehachapimountainvineyard.com. Grace Fellowship Church, What is truth? discussion group, Wednesdays, 7 to 8:30 p.m., 213 E. Tehachapi Blvd. Call Terrence Flynn at 823-1950 or 310-561-0696. Tehachapi Good News Clubs for children 5-12 years with Bible lesson and activities after school on Tuesdays at Golden Hills, Wednesdays at Tompkins and Cummings Valley, and Thursdays at the Village at Tehachapi Apartments. Homeschoolers are invited to join the Village at Tehachapi Club. Registration forms can be obtained by emailing TehachapiGNC@gmail.com or calling Kathy Flynn at 823-1950. Mountain Bible Church, 630 Maple St.: Wednesday Nite Worship and Kid's and Youth Groups, 6 to 7:30 p.m.; Thursday morning Women's Bible Study, 9:45 to 11 a.m.; Friday morning Adult Bible Study, 9:30 to 10:30 a.m.; Sunday service, 10 a.m. Call 822-7541 or email infor@mountainbible.church. Tehachapi First Baptist Church, 1049 S. Curry St.: Church service each Sunday at 10:30 a.m. Call 822-3138 or email fbctehachapi.com. Items for Upcoming should be submitted by noon each Wednesday for the following week’s edition. Items are run at no charge on a space-available basis. 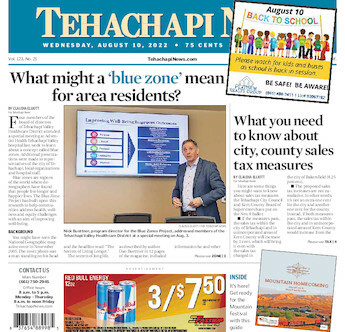 Email submissions to editorial@tehachapinews.com or drop by our office, 411 N. Mill St., Tehachapi.